This month I (Elaina Jo) will be ending my time at the Ignatian Spiritual Life Center, and come August I will be starting a full-time teaching job at a Catholic school in San Francisco. My time at St. Agnes and the ISLC has been full of abundant blessings. It has become a home for me - a place where I feel safe, cared for, and loved. This community has taught me what it means to love the world and work for justice. One of the greatest ways I have seen this love is the way that you all have loved me, encouraged me, and challenged me to be my best self. I have learned how to be prophetic by listening to the prophetic voices of those who speak out about justice and peace, and from those whose actions speak louder than words in the way they have care for one another, our community, and all who walk through our doors. Before I go we have some great events coming up this month. We will be having a Book Sale as we refresh our ISLC Library & Book Store. I have used many of the books there for my M.Div papers, spiritual reading, and for fun! On Sunday, June 22nd I will be speaking at our next Solidarity on Tap event, and hope to share more about what the ISLC has meant to me. Sign-ups are open for the 19th Annotation and Ignatian Companions. This past year I did the 19th Annotation Retreat and it was one of the greatest gifts of grace in my life! You, the ISLC community, have nourished me body, mind, and soul. Thank you from the bottom of my heart. You will all be in my prayers as you continue to be the face of Christ as you love the world! 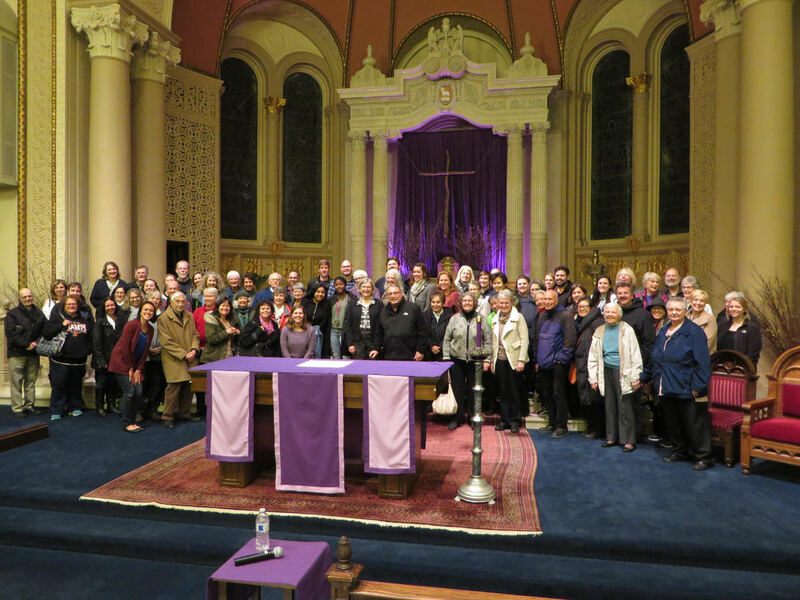 Last Saturday, I had the great privilege of sharing St. Agnes’s experience of providing sanctuary for a family at the Interfaith Movement for Human Integrity’s (IM4HI) Sanctuary Convening in Oakland. It was a powerful event filled with lively and committed groups across denominations and religions engaged in the work of Sanctuary as people of faith. I shared our insights on challenges, graces and lessons learned from our night with Francisco Herrera and St. Ignatius Parish, Reflections on Sanctuary. I also came away with ideas and connections to help our community remain responsive to the reality of immigrants and refugees. We discussed creative strategies for offering housing, legislative actions to be taken, ways that parishes can create a stronger North-South solidarity for deported immigrants in their home communities, and ways to support and integrate our sanctuary family more in our church, especially by letting those most directly affected by the immigration crisis set the tone and strategy for our work in Sanctuary. I invite you to join the conversation on how we exercise a faith that does justice in the future Huddles for Justice and with IM4HI. This summer is also time to recharge with a great film series and lots of ways to nurture our interior landscapes. Consider the opportunities we have at the ISLC like Spiritual Direction, the 19th Annotation Retreat and Ignatian Companions to give us the sustenance we need for the journey ahead. There’s also a great article below on ways to recharge your spirit in times of trouble. In the meantime, I’ll leave you with the words of Hafiz. Not loving is a letting go. Believe it or not, we are still in the heart of the Easter season. Christ is risen! How often, though, do I get caught up in the minutiae as the school year ends, as the hum drum of work continues, as I drive home in traffic? The ways to lose sight of this glorious moment and the invitation into a more profound way of living are endless. It comforts me, then, to read the post-resurrection stories of how Jesus continues to meet the disciples exactly as they were: locked in the upper room, discouraged and walking back from Jerusalem, gone fishing . . . Jesus was there, in the midst of his friends, urging them on in their grief until they could recognize him. This May at the ISLC, we invite you to “learn to see,” as Christine Rodgers’ evening of social justice poetry calls us. Envision a more just economy with the story of Capeltic coffee and the Jesuit mission in Chiapas, Mexico. Bring intention into parenting with the Mindful Parenting workshops of parishioner, Rebecca Walsh, and look back on the challenges and graces of living into our sanctuary commitment with a reflection facilitated by Francisco Herrera. As we continue to move through the Easter season, take heart that the new life emerging in our ordinariness often never looks as we would have expected. The poet John O’Donohue describes this inner movement beautifully and encourages us to believe “In out-of-the-way places of the heart / Where your thoughts never think to wander / This beginning has been quietly forming.” Join us in the ISLC’s events this May as we trust in these new beginnings. Waiting until you were ready to emerge. Still unable to leave what you had outgrown. Wondered would you always live like this. A path of plenitude opening before you. That is at one with your life’s desire. For your soul senses the world that awaits you. This past Easter, we shared in the joy of our sanctuary family receiving a new home in a 2-bedroom apartment in San Francisco. This would not have been possible without the incredible support of concerned parishioners who made calls to friends and made connections to local NGOs, who searched for housing, who generously donated time, meals, household items, furniture, clothes, and lifted up prayers for the family – thank you. As the family packed up to move during Holy Week, we reflected on the journey they have had and the mother recalled her trials of guiding her family through the shelter systems and “the misery” of living on the streets. Tears came to her eyes as she reflected on where she is now and how important it was to be a part of a community to move forward. This was not the first time I have heard that response from the children. From the youngest kids to the oldest, they have told me how they felt the presence of God in their time with the church, being safe in a physical place, but also with the presence of the good people surrounding them. As I was leaving a dinner with the family a week after they moved in, Reyna, the mother, popped her head out of the door and called after me, “See you soon! This is your home too!” In the warmth of her welcome and in the joyful way she offered me hospitality, I felt God there, bringing forth newness and life. Perhaps in Easter, this is who we are called to be: people who walk with each other on the way, through all of life’s uncertainties, struggles and joys, remembering that God is here in our midst. We now enter into a deeper accompaniment of the family as they find their way in the United States more independently. 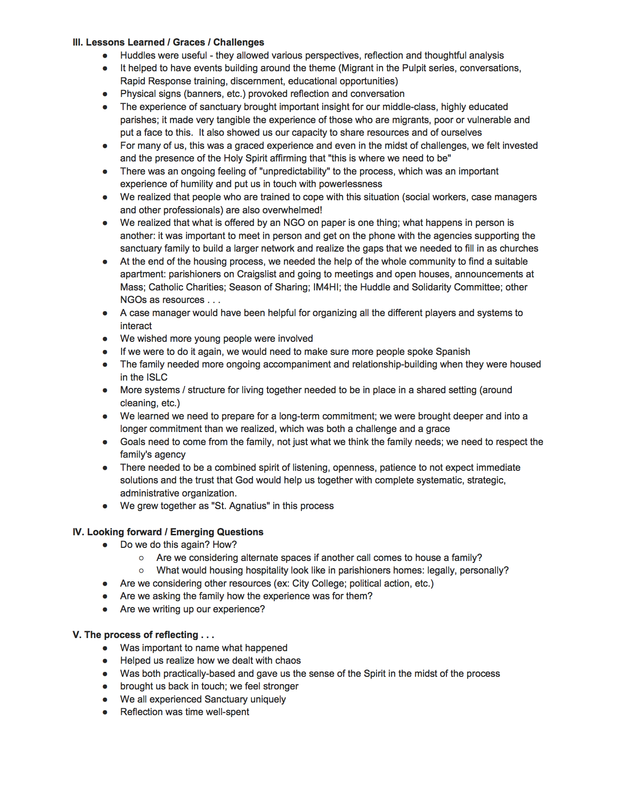 We hope to have a reflection together with St. Ignatius parish on lessons learned as sanctuary communities thus far. We hope to discern how to accompany and support our sanctuary family in this new transition. Stay posted for this event and for other ways on how we can continue to be committed and engaged with our sanctuary family and, of course, how to grow as an Easter people, too. This past week, we had the privilege of listening to Simone Campbell's dynamic presentation on her theology of abundance and her insights into the reality of 21st century poverty. A Nun on the Bus: How All of Us Can Create Hope, Change and Community. Books are for sale at a discounted price of $13 in the parish office (1025 Masonic). A clean heart create for me, O God, and a steadfast spirit renew within me. This March, we have continued to pray with our Lenten theme of sanctuary. After our peace vigil, we were honored to listen to the mother of our sanctuary family share her testimony of migration alongside another woman who crossed the border many years before. 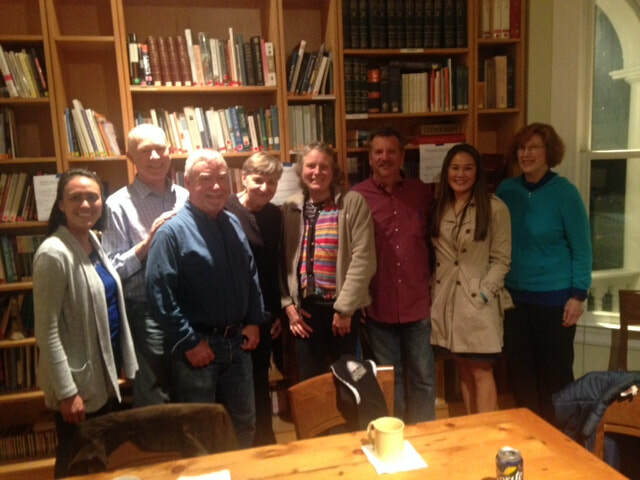 We also shared dinner and discussion with Jesuit Volunteers and Mercy Corps Volunteers on the human reality of migration and the role it plays in our faith. 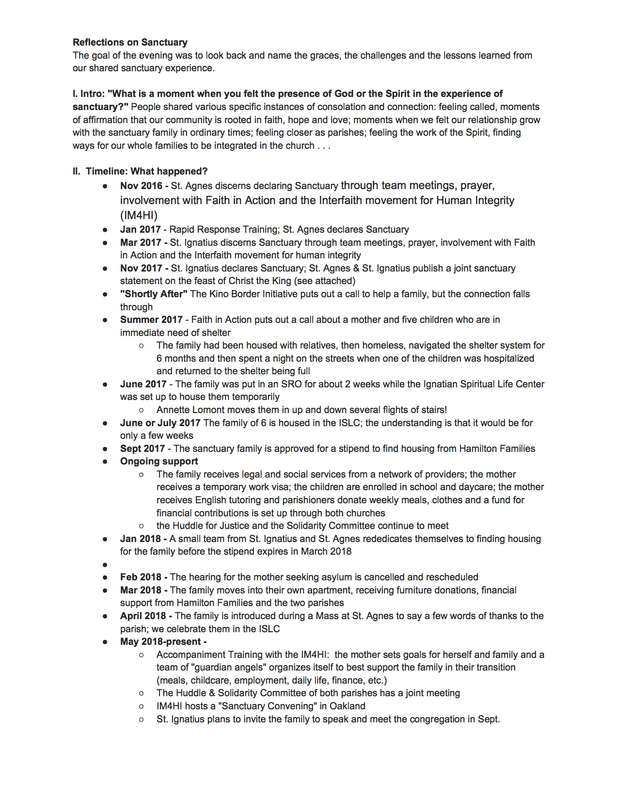 Importantly, for the last few weeks, we have also been intensely focused on finding safe and secure housing for our sanctuary family. The deadline to receive a stipend towards an apartment expires on March 29. Thankfully, there is a promising lead for a two-bedroom apartment in San Francisco, but still, the housing is not guaranteed until a few more important pieces come together. Throughout this process, I have been struck by a few things. I have been amazed at the level of coordination happening across parishes, networks and NGOs as we all make a concerted effort to support the family in this crucial step towards independence. I’m also amazed at the considerable amount of uncertainty that exists amidst all of our collective resources. As I accompany our family, I am struck by the surprising joy, persistence and resilience that bubbles up through the stressful situation they are in. The children always invite me into what is happening here and now; they invite me into relationship and real engagement, and they remind me what sanctuary is about: cherishing the life that we have, which is so vulnerable and precious at the same time. The family’s ability to flex and adapt is also quite something. They challenge us to work hard, to take risks, but also to trust in a God who pays special attention to those most in need. As we approach Holy Week, please join me in praying in a special way for our sanctuary family. We pray that the family can secure this wonderful housing opportunity. We pray in thanksgiving for who they are and who they have invited us to be: a community that is responsive, welcoming, steadfast and faithful. This Lent, we are also aware of our great need of bread for the journey and pray wholeheartedly with the psalm proclaimed this Sunday: “A clean heart create for me, O God, and a steadfast spirit renew within me.” Join us in the many gatherings we have planned for the rest of March: Simone Campbell’s special talk on her theology of abundance, a Spirituality of Relationships Retreat, Taize prayer on sanctuary, and the many ongoing programs we have for spiritual growth and nourishment. into the heart of the Holy. come once more into Lent. of palms, fried and baked. I know my humus place. I am one in the One. when the cosmos dreams in me. This year, Lent comes at a time when we once again know our own limitation and longing. In the midst of the crises, the deplorable treatment of the most vulnerable people in our society, and the loud bickering over political agendas, there is a turning in the Church towards our mortality: “Remember that you are dust and to dust you shall return.” It is almost with relief that we acknowledge that our lives are finite and we, thankfully, are not in control of the universe. In our limitation, we turn to our Creator to fill us, to teach us how to inhabit our days and to remind us of what it is that matters most in the end. As we live into our second year as a sanctuary parish, we look to Lent as an opportunity to reflect more deeply on the questions: Who is our deepest sanctuary? How do we become a sanctuary for others? We need God in so many ways. Here at the Ignatian Spiritual Life Center, we need God to help us secure a safe, stable home for the family that we shelter. We need God to give us the courage and clarity to know how to act boldly in our love, and when we can finally surrender our emptiness in humility, we need God to enter in, slowly working through our humanity to make us vessels of Her mercy and compassion. Warm greetings! My name is Grace Salceanu and I am the new director of the Ignatian Spiritual Life Center and Children’s Faith Formation at Saint Agnes. I’m delighted to be a part of this dynamic faith community. As I begin the new year at the ISLC, I feel I am surrounded by the many people who created a way for me to this role. Just last November, I moved back to the United States after co-directing Casa Bayanihan, the University of San Francisco’s alternative study abroad program in Manila, Philippines for over six years. It was a beautiful program, rooted in the four pillars of accompaniment of vulnerable communities, rigorous academics at Ateneo de Manila University, simple living in community and spirituality. We had vibrant neighbors and community partners who shared their tenacity and resilience in the face of grinding poverty and harsh injustice as well as a buoyancy and warmth that came from their goodness and a profound faith. In many ways, they became like the living Gospel for me. Before leaving Manila, our friends blessed me and sent me forth with their guidance and love. I lean on their memories and their strong witness, holding them close to my heart as I begin again. Orienting myself to the reality here in San Francisco, I see I am surrounded by you, a community that is eager to engage in the life and struggle of this city and its people. This is consoling to me, and, as in the Philippines, I feel drawn to follow this example of commitment, to know the issues and relationships that animate this place and to love them fully, as they are. The Gospel this Sunday reminds us that we bring each other to the Lord, that the Kingdom of God is not built alone. Companions guide us to that deep Source who asks us, “What are you looking for?” I look forward to walking with you, a community that thirsts to know the One who wants to know us, who is Peace and who challenges us to a radical kinship and justice. Thank you for welcoming me. I look forward to sharing the way together. Every stranger who knocks at our door is an opportunity for an encounter with Jesus Christ, who identifies with the welcomed and rejected strangers of every age (Matthew 25:35-43). The Lord entrusts to the Church’s motherly love every person forced to leave their homeland in search of a better future. This solidarity must be concretely expressed at every stage of the migratory experience – from departure through journey to arrival and return. This is a great responsibility, which the Church intends to share with all believers and men and women of good will, who are called to respond to the many challenges of contemporary migration with generosity, promptness, wisdom and foresight, each according to their own abilities. The Roman Catholic Jesuit Parishes of San Francisco - St. Agnes and St. Ignatius – recognize God’s call to respect and protect the human dignity of all people, regardless of where they are in life’s journey. We share with God the deep desire for a world rooted in peace, mercy, and compassion. With the City of St. Francis as our home, we are compelled to follow the example of our patron, as well as heed the Church’s call to a preferential option for the poor and the urgent exhortation of the Society of Jesus to be women and men for others and accompany migrants on their journeys. To that end, the Parishes together affirm that we are sanctuaries for migrants, refugees, and other peaceful people who may be subject to exclusion or removal from this land. As sanctuary parishes, we are working together to treat all our brothers and sisters – including those who seek to be among us, but have not yet completed their journey, and those who are among us, yet undocumented, unwelcome, or unfairly targeted – with the same respect and dignity afforded any person in our community. Welcome, listen, and respond to the call and needs of our brothers and sisters to the best of our ability. Partner with the Archdiocese of San Francisco in cooperative efforts regarding migration. As Catholic Jesuit Parishes, we are specifically called to join in the larger Jesuit commitment to serve and walk with migrants throughout their journeys. We know that this process and the people we meet will change our hearts; this is truly what our faith is about. That is, we offer this pledge to serve our brothers and sisters, all for the greater glory of God. A ministry of St. Agnes Parish in the Haight-Ashbury neighborhood of San Francisco, the Ignatian Spiritual Life Center has a three council structure that discerns the programming we need to live an Ignatian life of devotion and service. Our areas of focus are Church Justice, Global Justice and Spiritual Life. Each council offers programming aimed at mobilizing the larger community to love the world the way God intends. Programming includes adult education and faith formation, the Spiritual Exercises of St. Ignatius, spiritual direction, opportunities for prayer and retreat, and an ongoing commitment to dialogue and service in our Church and world.